Episode 317 - Unusual Incident in Seireitei?! Gotei 13 Invading Army Arc! After cleansing and restoring the barriers where Karakura Town was temporarily swapped with Soul Society, Matsumoto and Nanao enter the Precipice World to return home, but are confronted by something along the way. Episode 318 - Renji vs. Rukia?! Battle With Comrades! While Kon tries to keep the green-haired girl a secret from Ichigo's family, Ichigo himself is placed under confinement in Seireitei. Episode 319 - Ichigo's Capture Net! Escape From Soul Society! Uryū Ishida shows up and confronts the mysterious scientist while Kon is unable to respond. Nozomi is left unconscious, captured by Kira and Nanao. 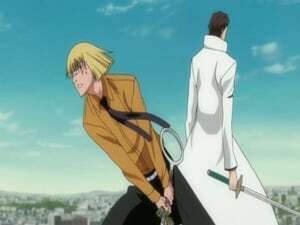 Ishida is defeated by the scientist and his zanpakuto, Raiku. Ichigo, Rukia, and Yoruichi are trying to form a plan to escape Soul Society since they assume the Reigai blocked the Senkaimon. Yoruichi sacrifices herself and fights the captains and lieutenants to let Rukia and Ichigo escape. Orihime and Chad show up to save Ishida and Chad is also defeated when he is trying to give Orihime time to heal Ishida. 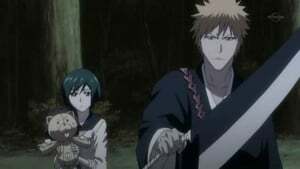 Ichigo and Rukia arrive and Ichigo proceeds with fighting the scientist. He reveals his name is Kageroza Inaba, and easily deals with Ichigo in his weakening state. Just as he is about to kill Ichigo and Rukia, Renji appears and attacks Inaba with his zanpakuto. The other captains and lieutenants involved in the incident arrive to face Inaba, and Hitsugaya retrieves Nozomi after dealing a blow to fake Kira. The scientist then admits that he is behind the Reigai incident, and then claims once he has Nozomi, he will be able to conquer Soul Society and the World of the Living. Inaba escapes to Soul Society and meets with the Reigai. He deems them the Invading Army, and tasks them with retrieving Nozomi and eliminating the originals. Episode 320 - Gotei 13, Gathering in the Real World! At the Urahara Shop, Ichigo, Uryū, Sado are sitting at a table silently, as Orihime assesses the condition of Nozomi Kujō. She stirs in her sleep, much to Orihime's surprise, as Uryū informs her of her whereabouts. He reassures her, stating that they are in a safe location. As Nozomi attempts to get up, Orihime tells her not to over-exert herself, as Kon appears, asking if she is alright. Episode 321 - Showdown of Mutual Self, Ikkaku vs. Ikkaku! Shunsui Kyōraku meets up with fellow captain Jūshirō Ukitake, whereupon they discuss in private how the incident seems too planned out to be believable. Ukitake asks him what they should do next, to which he suggests that they go through the events from the start. He recalls Genryūsai Shigekuni Yamamoto informing the other captains during a meeting of the return of Kenpachi Zaraki and Mayuri Kurotsuchi. Episode 322 - Clash! 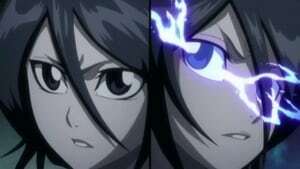 Rukia vs. Rukia! In Karakura Town, Nozomi Kujō wanders listlessly around the town, with Kon in close pursuit. He asks her where she is going, to which she states that she doesn't know. He berates her for walking around without knowing where to go, to which she throws a rock at Kon, pummeling him into a nearby tree. He shouts at her avidly, prompting Nozomi to say that she has a place to go to, but doesn't know the exact location. Ichigo Kurosaki, Yasutora Sado and Orihime Inoue run throughout Karakura Town. Orihime confirms that she sensed the reiatsu of Rukia Kuchiki, as Ichigo heads out to assist them. However, she tells him to search for Nozomi Kujo, stating that she will go to the river. Ichigo agrees to this, prompting Sado to volunteer to stay by her side, as they split up. Meanwhile, Kon is still leading Nozomi to the mountain shrine, as she asks how long the journey will take. Episode 324 - Recapture Seireitei! The Captains Move! 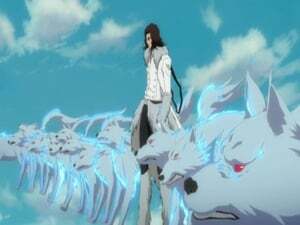 Hitsugaya, Byakuya, Kenpachi, and Komamura, the four captains trapped in the living world, use Urahara's senkaimon to return to Soul Society. They fall into Inaba's trap in the Precipice World, where Komamura stays behind to counter the restrictive current. As the other three arrive, they go separate ways and Kenpachi encounters his false counterpart. He engages his clone in fierce combat, at first being defeated. 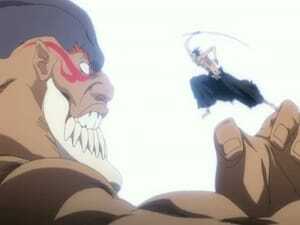 However he regains the upper hand and destroys the Reigai after encouragement from Yachiru. Meanwhile, Fake Ukitake and Kyoraku continue battling Yammamoto, claiming that they have not lost their pride despite being Reigai. Also, Isane and Unohana confront Inaba at his headquarters. He explains how he made the fake soul reapers, and then Isane turns on Unohana, revealing herself to be an imposter. The Unohana Reigai then arrives and meets with the original. Episode 325 - For the Sake of the Believers! 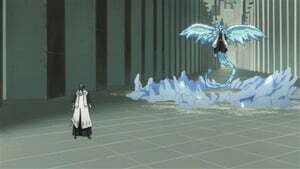 Byakuya vs. Hitsugaya! Unohana and her imposter engage in a kido conflict, with Unohana escaping. The Fake Kyoraku and Ukitake are unable to defeat the head captain, who criticizes their claim that they retain their pride. Fake Unohana arrives and heals their wounds, revealing their strategy to exhaust the head captain. Elsewhere in Seireitei, Byakuya is stopped by the Fake Hitsugaya, and the two unleash their bankais in a brief battle. Byakuya asks the imposter why someone would fight for Inaba, and Fake Histugaya claims that he want to protect some one, whom the original also want to protect but the original one does not have the power to do it,which he has. Byakuya criticizes his motives and eventually manages to defeat him, though narrowly escaping Hitsugaya's Hyoten Hyakasso. 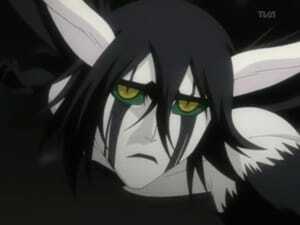 Back in the living world, Ichigo asks Urahara to send him to Soul Society. He is advised not to go due to his declining spirit energy. 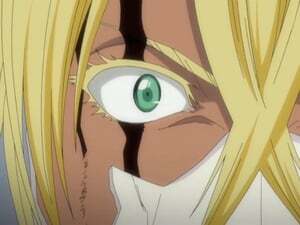 However, Nozomi steps up and reveals a type of healing kido that restores some of Ichigo's lost spiritual power. He then proceeds with heading to Soul Society, where Inaba meets with Nozomi's unconscious soul claiming she will return. Ichigo enters the Precipice World and heads toward Soul Society. 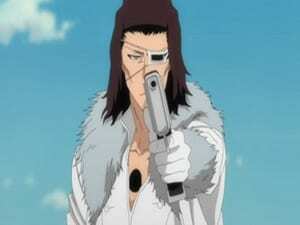 Byakuya kills fake Hitsugaya and moves forward, where he encounters fake Byakuya. While in a bamboo forest, Kenpachi is attacked by Soi Fon and the Punishment Force. He easily defeats all of Soi Fon's forces. Ichigo reaches Soul Society where he encounters Inaba. Elsewhere Hitsugaya is confronted by fake Hinamori. Despite knowing she is an imposter, Hitsugaya cannot bring himself to kill her. The real Hinamori seems to appear and attacks her Reigai. 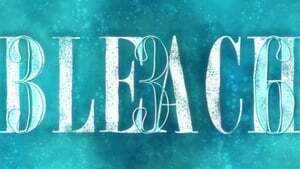 After tricking Hitsugaya into saving one of them, they reveal that both of them are Reigai and cut him down. Yoruichi then appears and defeats both of the Reigai, saving Hitsugaya. Meanwhile, Soi Fon attacks Kenpachi, but Komamura interrupts and challenges fake Soi Fon. As Ichigo arrives in Soul Society, he is attacked by Inaba, who explains that Ichigo's lack of purity makes him an erasable anomaly. Inaba then uses his zanpakuto to trap Ichigo in the Precipice World. Episode 327 - Pride of the Kuchiki Family! Byakuya vs. Byakuya! 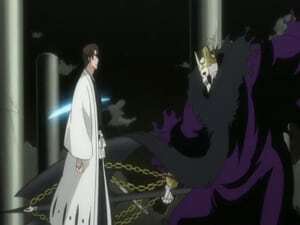 Byakuya confronts his false counterpart, originally struggling until he releases his bankai. Meanwhile, Komammura is having difficulty dealing with fake Soi Fon, whose speed and abilities seem to outmatch his. In a desperate final attempt, both he and fake Soi Fon clash with their bankais, and the battle ends in a draw. Elsewhere, a frustrated Head Captain Yamammato releases a powerful wall of fire, seemingly engulfing the imposters that were challenging him. In the World of the Living, Ichigo's friends express concern when Urahara tells them he cannot detect Ichigo's spirit energy. Episode 328 - Defeat Kageroza! Shinigami, All-Out War! Hitsugaya and Kenpachi arrive at Inaba's base of operations. They engage him in combat, and Inaba reveals his Zanpakutō can record attacks in the Precipice World and fire them back at the opponent. As Inaba gains the upper hand, Yoruichi and the captains arrive, aside from the head captain and Mayuri. Inaba summons the remaining Reigai, and a brawl between the originals and the fakes ensues. At first the captains and Yoruichi are able to overpower Inaba and his forces. However when they lose the upper hand, fake Mayuri slashes Inaba, revealing he switched places with the imposter. Elsewhere, Ichigo is rescued in the Precipice World by a mysterious figure. Episode 329 - The Forbidden Research...Nozomi's Hidden Secret! Ichigo awakens at Urahara's shop, mystified as to how he was rescued. Urahara tells him that there are several ways to escape the restrictive current but none to escape the cleaner so it is unknown how Ichigo escaped. 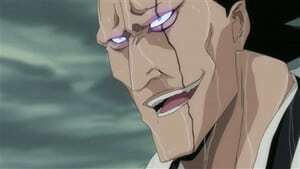 Elsewhere, Mayuri uses his zanpakuto to drug Inaba. Inaba then summons fake Isane and attacks her. At Urahara shop, Rukia then explains Project Spearhead to the rest of the group in which mod souls were used. Inaba then takes the soul candy from the Reigai and swallows it, resulting with Inaba being rejected from his body and the Reigai taking the effects of the drug. Inaba then ressurects most of the defeated Reigai, unleashing their true strength and revealing his backstory as the one who created mod souls. The episode ends with Nozomi admitting she was the first mod soul. Renji reports to the head captain and informs him that the captains involved in the brawl with Inaba have not been heard from. The head captain states that only the soul reapers in the Living World and Ichigo's group are prepared for battle. He then speculates several hollows may have gathered due to the spiritual disturbance. When Ichigo and Rukia leave Nozomi's company to deal with a hollow, she leaves the house and goes for a walk. Nozomi herself is then attacked by a hollow, and Kon arrives to defend her. After the hollow easily deals with them both, Nozomi's frustration releases a bout of spiritual pressure, and she regains her zanpakuto and soul reaper abilities, defeating the hollow. Episode 331 - For the Sake of Fighting! The Awakened Nozomi! After regaining her zanpakuto and reaper abilities, Nozomi decides that she wants to help defeat Kageroza, but is met with opposition from Ichigo and the other soul reapers since she cannot remember her zanpakuto's name or it's power. 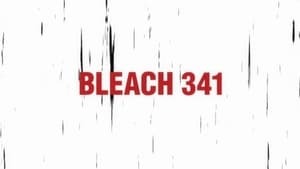 Ichigo, Chad, Ishida and Rukia decide to help Nozomi awaken her zanpakuto's dormant powers through the same rigorous training that Ichigo underwent to awaken his. Meanwhile, Kageroza orders the fakes of Byakuya, Hitsugaya, Zaraki, and Komamura to infiltrate the Living World. While traveling through the Precipice World, they fall into a trap set by Urahara and are separated when they finally do reach the Living World. 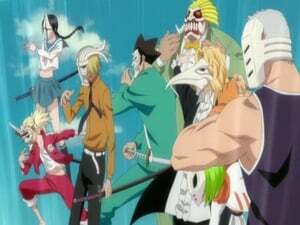 To buy Nozomi more time to awaken her zanpakuto, Ikkaku and other soul reapers battle with the captains from the Invading Army. Yumichika tells Ichigo and the others that they won't awaken Nozomi's zanpakuto if both sides keep holding back. 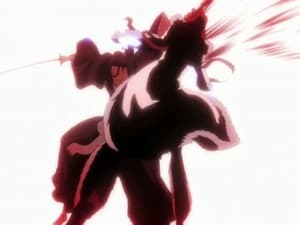 After Ichigo throws a Getsugatensho at Nozomi, she finally remembers her zanpakuto's name, Arazomeshigure, which seemingly swallows up all of Ichigo's zanpakuto's spiritual pressure.Ikkaku, who was fighting fake Zaraki, looks like he is about to be delivered the finishing blow when Nozomi arrives and seemingly obliterates fake Zaraki with her Arazomeshigure. Episode 332 - The Most Evil Reigai, Appearing in the Real World! Hisagi and Kira take on fake Hitsugaya while Matsumoto and Iba fight fake Komamura. Renji and Rukia take over Omaeda's battle with fake Byakuya when he seemingly loses to him. While Yumichika is tending to Ikkaku and talking to Ichigo and Nozomi, fake Zaraki appears. Excited about Nozomi's power, he wants to fight her, but Yumichika tells her and Ichigo to stand back and tend to Ikkaku's wounds so that he can avenge his fallen comrade. Not satisfied with that, Nozomi goes around to the different battles to help, but all of the captains tell her to get out of the way and go to safety. Yumichika, Hisagi, and Kira are all taken down, and Renji and Rukia look like they are at their limit. Fake Zaraki challenges Ichigo and Nozomi, and fake Hitsugaya is eager to join in. However, Nozomi deals a considerable amount of damage to him in one shot. Fake Byakuya, realizing the power of her zanpakuto, tries to keep her from using it by binding her with his kido and is about to destroy her when Ishida saves her. Ishida, once seeing Nozomi absorb his Ginreikojaku, deduces that her zanpakuto can absorb anything with spiritual pressure. Having no other choice but to rely on her, the remaining soul reapers plus Chad and Ishida all direct their spiritual pressure at Nozomi, which she redirects at the Invading Army captains. Fake Byakuya survives the attack and is about to unleash his Bankai when the Head Captain suddenly appears and defeats him. Episode 333 - Destroy Nozomi?! Genryusai's Decision! The Head Captain asks the remaining soul reapers if Nozomi is the one he heard about in the report. Rukia replies that she is, and that her name is Nozomi Kujo. Yamamoto responds by stating that her name is unimportant, as she is a Mod Soul. This upsets Nozomi, and angers Kon. He also states that they don't need help from a Mod Soul. Suddenly, Yamamoto senses a strong spiritual pressure emanating from the sky. From a crack within the sky, Fake Kyoraku, and Fake Ukitake appear. Ichigo tells Rukia, and Renji to stay back, as well as bring the other injured soul reapers (Uryu, Sado, Yumichika, Iba, Kira, Hisagi, and Matsumoto) to Orihime to be healed. Fake Kyoraku, and Fake Ukitake release their shikai, and Yamamoto does the same. Yamamoto tells Ichigo to stay back as well, stating they will only get in his way. Nozomi refuses, and attacks Fake Kyoraku and Fake Ukitake, but fails to land a strike. Ichigo spars with Fake Ukitake, and Nozomi with Fake Kyoraku. Meanwhile, Yamamoto was distracted and Fake Unohana activates several Bakudo seals, immobilizing him. Ichigo, noticing Nozomi's defeat at Fake Kyoraku's hands performs Bankai. Ichigo fires a Getsuga Tensho at the attackers, but Fake Ukitake uses his shikai to absorb, and redirect it at him, who barely manages to avoid it. Yamamoto destroys the seals with his reaitsu and the real Unohana uses a Bakudo on the Fake Unohana. The three fake captains all attack Yamamoto, but Kagerosa appears commanding them to stop. Kagerosa battles Yamamoto but the latter seems to have the upper hand. Nozomi offers to be a decoy for Ichigo and Yamamoto to prevent Kagerosa from copying their techniques. Nozomi attaks Kagerosa, but the latter avoids crossing swords with the former, as he is well aware of her abilities. 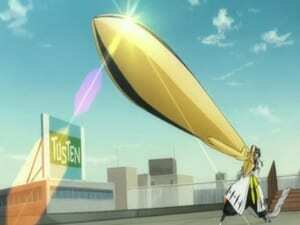 However, Nozomi reveals that her sword has already absorbed energy from Yamamoto's zanpakutou. he avoids the attack from Nozomi, but Yamamoto attacks him with his flames. Kagerosa manages to nagate the flames with his zanpakuto's abilities, but it was only a diversion for Ichigo's Getsuga Tensho, which is used on Kagerosa. Ichigo collapses, and Nozomi tries to catch him, but Kagerosa is alive, and reveals that before the impact of Yamamoto's Ryujinjakka, he copied Nozomi's abilities and use her absorbing ability to absorb both the attack of Yamamoto's Ryujinjakka, and Ichigo's Getsuga Tensho. With Ichigo gone, Kagerosa uses the combined attack to finish off Yamamoto. However, Nozomi appears before the blast in an attempt to absorb the attack. Episode 334 - The Depleting Reiatsu! 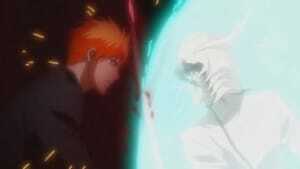 Ichigo, Death Struggle of the Soul! 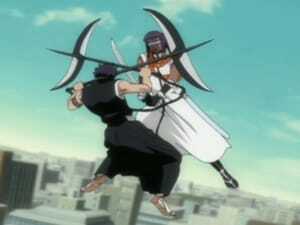 Nozomi's Zanpakuto breaks in the midst of trying to protect Genryusai from Kageroza's attack. As Ichigo and Kon try to save Nozomi from being taken away, Kageroza reveals to everyone that he and Nozomi were created by the same reishi of another shinigami. Inaba defeats everyone while Nozomi and Kon run away. Nozomi sadly binds Kon to a rock with kido and runs away without him. Ichigo is seen still conscious and struggling to catch up with Nozomi. Nozomi is found by Inaba, who falls due to a loose rock on a slope. 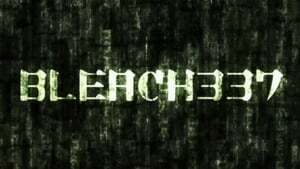 Ichigo finally catches up and defeats Inaba with a Getsuga Tenshou, only to discover that it was a clone of Inaba created by his zanpakuto' special ability. Inaba knocks Ichigo out in one swipe and knocks Nozomi out and proceeds to leave the world of the living with her. Kon, still binded to a rock tries to follow them but is too late. He is seen crying Nozomi's name while Ichigo's shihakusho turns white. Episode 335 - Hiding in the Precipice World? Ichigo is Alone?! Following his defeat by Kageroza, Ichigo has lost his Shinigami powers. Still determined to save Nozomi, Ichigo and his friends gather at Urahara's shop to come up with a rescue plan. 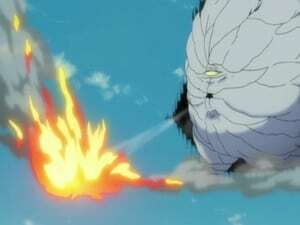 Urahara comes up with a risky plan that involves Ichigo being swallowed by the Kōtotsu to retrieve a sample of his shinigami powers, since he was swallowed before. The plan works and Ichigo gets out of the Kōtotsu. When he meets up with everyone, he states that he saw another him when he was inside the Kōtotsu, leading Urahara to conclude that Ichigo saved himself when he was first swallowed,since there is no time in the Kōtotsu. Episode 336 - Pursue Kageroza! Technological Development Department, Infiltration! Inside the Precipice World, Rukia and the others act as decoys to draw away the Reigai's attention while Ichigo, Urahara, and Kon break into the Seireitei. As they search for Kageroza's laboratory, Urahara makes an attempt to restore Ichigo's lost Shinigami powers by creating a mod soul candy, but is discovered by the Reigai of Nemu and Nanao. At last minute before an explosion, Ichigo breaks the glass containing the candy and consumes it. However, as stated by Urahara, the candy was incomplete, making the balance between Ichigo's shinigami and hollow powers unbalanced. While escaping, the three are ambushed by the reigai captains, but are saved when Yoruichi and the originals appear, ready to fight. The captains and lieutenants of the Thirteen Court Guard Squads thought to have fallen in battle return to fight the Reigai. Meanwhile, Ichigo’s spirit energy and Hollow powers continue to grow unstable, forcing him to rest for the time being while Urahara and Kon continue there investigation on Inaba. Urahara and Kon later find out about Yushima Okouyo, the shinigami who created Inaba and Nozomi. When visiting Yushima's cell in the Maggot's Nest, they get attacked by the reigais of Soi Fon and Omaeda, but are later defeated by Urahara. The two visit Yushima's cell, only to find him unresponsive, leading Urahara to conclude that Yushima will never gain consciousness. Meanwhile, Ichigo's hollow side finally takes over and escapes the building he was in. Urahara deduces where Kageroza's other lab might be, and he and Kon head to that location, only to be halted by a reigai of Kisuke. As Urahara battles his reigai counterpart, Kon dashes down into the lab, where he promptly tries to awaken Nozomi inside her capsule. She does awaken and at first insists that Kon escape, but after seeing his persistence, and his devotion of trying to save her, whom he considers a friend, she tries to help Kon restore Ichigo's Spritual Pressue. Before Ichigo's soul capsule can be created however, reigai Nemu appears and stops the transfer. Immediately afterward, the fusion process is complete. Hollow Ichigo defeats the members of Squad 8 and is about to destroy the reigai of Ise when the fused Yushima appears before him. Episode 339 - Protect Ichigo! The Bonds of Friendship! Yushima shows no interest in fighting Hollow Ichigo, and tries to walk away. But the mindless Hollow continues to pursue him, leading them both to clash on Sokyoku Hill, while the Captains and their reigai counterparts are finally joined by their lieutenants, who help them in the battle. Uryu, Renji, Rukia, Chad and Orihime arrive on Sokyoku Hill and try to stop Yushima, but the combined powers of Nozomi and Kageroza prove to be too much for them. Yushima reveals the true nature of his zanpakuto and defeats everyone, but before he can finish them off, Hollow Ichigo jumps in front of Rukia to take an attack that was meant for her. Episode 340 - Reigai vs. Original, The Fierce Fighting for Gambled Pride! Yushima's Zanpakuto stabs Hollow Ichigo, and within his own consciousness he can see Nozomi inside Yushima's as well. 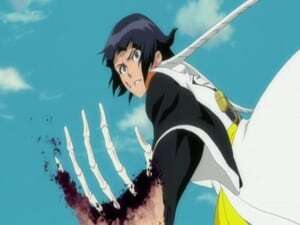 Nozomi calls out to Ichigo, but before he can do anything to help her, Yushima regains his will and attacks him, causing his Hollow-self to break apart. Now powerless once again, Ichigo is left to watch as his friends attempt to overpower Yushima. But no matter what they try, he finds a way to break through it. Yushima has reigai-Nemu bring him something that will help the fusion become permanent, and when she arrives, she unexpectedly kicks him backward. 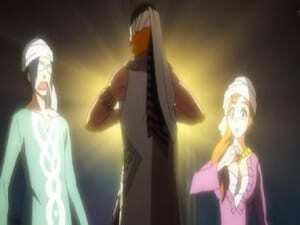 It is revealed that Kon was helped by Urahara and Mayuri by placing his Soul Candy into that of the reigai. Kon gives Ichigo a complete gikongan which he takes, and it restores his Shinigami powers. He prepares to unleash his bankai against Yushima. Meanwhile, Byakuya has deduced that the reigai do not sacrifice themselves to attack the originals when they are all together, as it goes against what they and Yushima believe in. The originals join forces against the reigai to protect the Soul Society. Episode 341 - Invading Army Arc, Final Conclusion! As the captains and lieutenants battle it out with the Reigai, Ichigo uses his restored powers to fight the fused form of Inaba and Nozomi. Gradually losing his temporarily restored powers, Ichigo struggles against a hollow, but is saved by Rukia. The shinigami in charge of Karakura town, Kuramadani Zennosuke interrupts their conversation, yelling at them to stop doing his job. The next day, Rukia is instructed a mission by Ukitake to prevent Ichigo from fighting because of the fast rate of his disappearing spiritual powers. That night, Ishida and Rukia save Ichigo from a hollow and tell him to rest, much to his dismay. The next day, Ichigo takes Rukia and his friends to an ice skating rink, since he saw Rukia staring at the place a lot. Fireworks from a nearby amusement park begin to shoot up in the sky, ending the day on a happy note. While walking home, Ichigo senses a giant hollow and goes to his shinigami form, before being stopped by Rukia. Ichigo once again struggles against the giant hollow as his powers begin to fail him. Rukia saves him, leaving Ichigo to question if he was getting in her way. Rukia replies with a heartwarming speech about their friendship. Ichigo requests for Rukia to freeze the hollows legs, and he fires his "last getsuga tenshou," destroying the hollow. Ichigo, exhausted, has a brief conversation with Rukia before he is told to rest. Ichigo wakes up in his human body, in his room, with his friends surrounding him. Ichigo takes note of his disappearing powers, and asks to go outside. Outside, Ichigo notices that he can barely sense spirits anymore and even Rukia's presence is disappearing. The two say goodbye and have a brief conversation before Rukia begins to disappear from Ichigo's sight. After Rukia fully disappears, Ichigo thanks her.